Have you ever felt that your expenses almost always overrun your take-home pay; like you’re never earning enough to actually enjoy the fruits of your labor? The feeling of “dumaan lang sa palad ko ang pera” can be very disheartening, especially if you know that you’re doing your best to save up—but before you trash your company by saying "Kuripot sila," you may want to first reevaluate your current lifestyle, because you might also need a little tweaking on your end. To give you a sense of clarity about how you actually are spending your money, try writing down your expenses every day for two weeks to a month. That includes everything from meals, to transpo, to that one guilty stick of cigarette. It can get tedious, but two pay periods are more or less needed to see your spending pattern. After the given timeframe, cross-check your expenses against your actual budget, and you may just be surprised at where the bulk of your suweldo actually goes. But don’t beat yourself up over it. Instead, tweak your budget to accommodate not just your bills and existing debts, but also leisurely activities that actually make you happy, as well as money that you can invest in a viable financial vehicle. Don’t feel guilting about paying yourself through savings and the once-in-a-while self-care session. One reason why you feel like you don’t have enough money is because you actually don’t spend enough of it on loving and improving yourself. If there’s one person who deserves to enjoy the cash you’ve worked so hard for, it’s you. 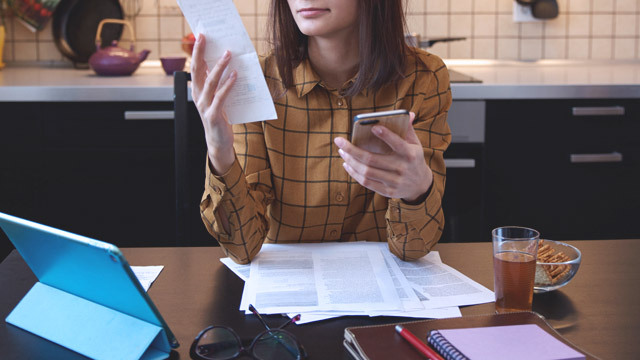 Now, you may say that you don’t have enough money to spend on yourself because you have an existing credit card debt that you can’t seem to get rid of. It’s a situation that's happened to me before, and what I did was to sit down and calculate how I can pay everything off in a year based on what I can afford without sacrificing necessities and small niceties. It’s not an easy thing to do, because unless you can pay off everything in one go, you’ll have to accept that you’ll be shelling out money for finance charges every month as you whittle your debt to zero. But remember that all big things can be cut down to size, and as long as you don’t use your credit card for the time being and you don’t accrue any more debt, you’ll be fine. You can also check out banks that offer balance transfer schemes with enticingly lower finance charges, but the system is still the same—pay consistently on a monthly basis, inclusive of finance charges. While debt can be very frustrating, know that with enough discipline, it need not take over your life. Do not allow debt to eat into other important things you need to pay for, and don’t let it squeeze away the simple but good things that make you happy. When you find the right balance, you’ll realize that you do have the money to get your finances back in the green without sacrificing too much of everything else. If you’re the kind of woman who looks at her salary and heaves a sigh of regret knowing that it’s not really her money due to the things has to pay for, then it’s time to change your mindset. Own the moolah. Sometimes, you feel like you don’t have enough because you don’t feel that it’s yours. Fact check: it is. You may have a lot of responsibilities, but you still decide where your cash goes. While money is important, it’s just a means to an end. When you realize that, you’ll also begin to feel that somehow, what you have is actually enough.